Pakistan's obsession with India has left it too reliant on a handful of partners -- including China, whose President Xi Jinping is seen here with Nawaz Sharif. In an increasingly interconnected world, Pakistan needs to move past India and toward diversification. Pakistan’s foreign policy — or lack thereof — is perplexing. The present government does not have a foreign minister; instead there is an advisor to the prime minister on foreign affairs, Sartaj Aziz. Then there is a special assistant to the PM on foreign affairs, Tariq Fatemi. Both of them are close aides of Prime Minister Nawaz Sharif, who is known to fill all important ministries with his trusted deputies. However, Sharif has kept the portfolio of the Ministry of Foreign Affairs for himself. Some analysts argue that he does not trust anyone to make important foreign policy decisions. Whatever the reason, Sharif as the prime minister of the country does not have the time to keep up with a rapidly changing and dynamic international system. As such, the absence of a dedicated foreign minister explains the abysmal management of foreign affairs. The recent performance of the foreign affairs department speaks volumes in this regard. For instance, in the past few months Pakistan has shown poor handling of the killing of Taliban leader Mullah Mansour by a U.S. drone strike on Pakistan’s soil; the inability to manage U.S. congressional opposition to the sale of F-16s at a discount rate; and a failure to mediate the Saudi-Iran crisis. In all likelihood, one would have witnessed a better resolution to these issues had there been an active foreign minister. Indeed the unsatisfactory performance of the civil government ceded space to the military to take charge of important foreign policy decisions that can potentially affect Pakistan’s national security. It can be said that the army chief, General Raheel Sharif, is the de facto foreign minister, as made evident by his tours to countries of strategic interest like the United States, Saudi Arabia, and China. Undoubtedly, Pakistan needs to appoint a full-time foreign minister who can ensure a coherent and active foreign policy front with the civilians taking the initiative and not the military. That being said, Pakistan’s foreign policy is not only a bureaucratic issue. Foreign policy decisionmaking to date has been predominantly influenced by a single factor: India. Since the inception of Pakistan, India — due to its sheer size and resources — has been a great source of insecurity for the country. To balance the Indian threat, Pakistan has always looked toward powerful and bigger countries; initially, this meant the United States, and now increasingly Pakistan is putting all its eggs in the Chinese basket. Whether or not India is currently an existential threat to Pakistan is a different debate altogether. However, Pakistan’s approach — looking at the international system through the lens of the Indian factor — is problematic. The enmity and mistrust with India has obliged Pakistan to assess foreign policy via a security lens. This security-centric view of the world compels Pakistan to perceive threats rather than opportunities. For instance, the trilateral Chabahar agreement between India, Iran, and Afghanistan has been termed as a security threat by Pakistan’s security analysts. Chabahar is viewed as undermining Pakistan’s Gwadar port and the China-Pakistan Economic Corridor (CPEC) project. Meanwhile, Chinese Prime Minister Li Keqiang declared himself convinced that both projects, Chabahar and CPEC, can complement each other and boost the region’s economic growth. With Indian finances involved in Chabahar, however, Pakistan’s apprehensions have not dissipated. Discerning the world in binaries is affecting Pakistan’s ability to modernize its foreign policy and engage in skillful diplomacy. 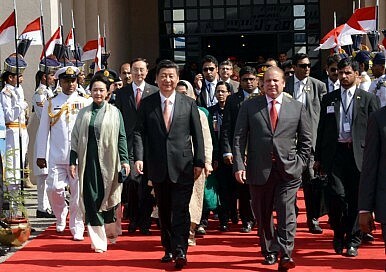 Foreign relations are regarded as black and white; there is no grey area for the Pakistani elite. Anything and everything revolves around a zero-sum game with India, while Pakistan finds it difficult to extract benefits out of regional and international projects involving its arch-rival. This disposition is isolating Pakistan in the region while India is making strides with all countries in South Asia. Chabahar is one example. Afghan President Ashraf Ghani, in contrast to his predecessor Hamid Karzai, extended a hand to Pakistan; by failing to bring the Taliban to the table, Pakistan lost a potential partner. The increased closeness of Iran and Afghanistan with India is seen with suspicion and mistrust in Islamabad, without appreciating that Pakistan too can have a distinct strategic relationship with each of its neighbors. Beyond the region, Pakistan’s position of backing the Afghan Taliban to prevent India gaining a foothold in Afghanistan has also invited vilification from the international community, especially the United States. Supporting such actors for strategic gains is amongst the worst foreign policy decisions any country can make. India made such a mistake (and paid a price for it) in the 1970s and 1980s when it extended support to the Liberation Tigers of Tamil Eeelam (LTTE), or Tamil Tigers, in Sri Lanka. Pakistan, however, continues to suffer from its Afghan stance. Thousands of Pakistanis have died as a spillover effect of its “good Taliban” policy. It is also regularly accused of being an unreliable and insincere partner in the “War on Terror” by the United States and its allies. As such, Pakistan risks international isolation too, with China being the only important exception it can lean on. It is important to understand Pakistan’s history to empathize with its siege mentality. However, it is essential now for Pakistan to shed its Hobbesian view of the world and seek a policy of goodwill with all countries of the world, especially its neighbors. Other than the relatively easy step of putting in a full-time foreign minister, steps for rapprochement and reconciliation with India ought to be taken. Currently, whatever India does, like testing an anti-ballistic missile system, is seen as disturbing regional stability. A former top diplomat of Pakistan, Hussain Haqqani, once said that Pakistan’s ambition of seeking parity with India is akin to “Belgium rivaling France or Germany.” Therefore, the two neighbors needs to overcome the trust deficit between them. This will help Pakistan move past its security state mindset and its India-centric foreign policy. In the short term, however, Pakistan should learn to run with the hare and hunt with the hounds. Strategic partnerships and alliances should be sought with countries Pakistan has traditionally seen as untrustworthy due to their closeness with India. This includes Russia (which recently started rapprochement with Pakistan), Afghanistan, and Iran. By sticking to a select few friends, like China and Saudi Arabia, rather than diversifying its partners, Pakistan is venturing on a policy of isolation that will not do the country much good. Shahzeb Ali Rathore is a Research Analyst at the International Center for Political Violence and Terrorism Research (ICPVTR) of the S. Rajaratnam School of International Studies (RSIS), NTU, Singapore.